Choosing the Best Dog Harness or Puppy Harness for your dog made simple – we are UK dog harness manufacturers with years of experience and care. We make the best dog harnesses for walking your dog and for dogs who pull, our harnesses have both a sturdy front and back ring to use with a double ended lead to train your dog not to pull! 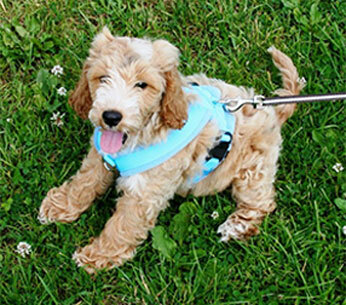 Our eDog harnesses are also most suitable for running/jogging with your dog. There are so many types and styles of dog/puppy harnesses available these days – few are good, even fewer are very good and the majority are very bad – we know this – because we receive 10-15 enquiries each day by phone or email and the enquiries have a constant thread running through them – they are from people who care very much about their dog’s comfort – people who have bought dog harnesses elsewhere that rub their dog raw, are ill-fitting and they have given up on the harnesses quickly – a total waste of money and in many cases their dogs have suffered discomfort and consequently the owner is wanting comfort and good fit above all the next time round. We want to pass on this knowledge and prevent you from making the same mistakes when choosing a dog harness whether you’re looking for the best puppy harness or best dog harness for your fully grown dog. Final size dog harness is at 9 months old. 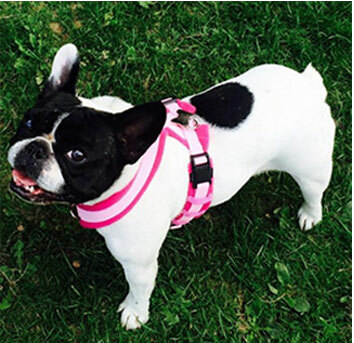 Our customers return to us time after time for dog harnesses in same size, different style, or wash one/ wear one scenarios, as our harnesses fit properly – we are UK dog harness specialists. Comfort – avoid the following materials – harnesses made of nylon webbing only – these types, cut-in and chafe/rub causing sore areas behind your dog’s legs (poor fit) – there is only 1 reason why these are harnesses are made – high profit margin as so cheap to produce. In our opinion they should be banned ! Avoid flimsy high necked mesh or stretchy fabric – these rip easily and especially at the back ring point which puts your dog at risk of running off in a flash and you being left with nothing but the D ring attached to your lead – frightening. Avoid un-lined leather, these can chafe and rub badly too. So what is comfortable – padded fleece, padded air-mesh, padded neoprene – we manufacture in double layer high quality fleece and structured high grade air-mesh – again double layer. We offer 4 harness strap widths to encompass all breeds of dog, from tiny toy/miniature breeds right up to large dogs weighing in excess of 100 lbs. We experimented with neoprene but only found it good for very large dogs, as in double layer it is so bulky and time consuming/difficult to sew. Most harnesses made from neoprene therefore will only have the chest plate made of neoprene, then the straps will be nylon webbing, not good. All fleece harnesses are not equal – we make ours fully fleece lined even behind the fasteners – see below – other fleece harness manufacturers do not do this. 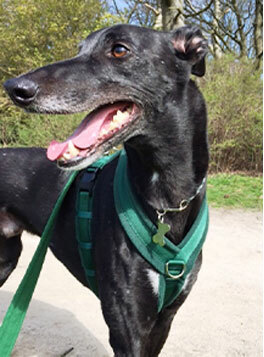 There are some versions of fleece harnesses whereby you will have to clip 3 parts of your harness together to get the right size – avoid these as there will be too many fasteners which will be in direct contact with your dog’s skin, and too much exposed nylon webbing joining the clips – not comfy. 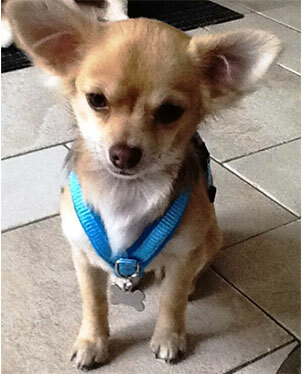 There are only 2 UK dog harness manufacturers – our company eDog Products and another. You may like to visit other websites to compare offerings. Please do so. The other fleece harness manufacturer also makes fleece harnesses for other ‘so called’ UK fleece harness brands who are not themselves manufacturers. We do not make harnesses for any other brand – we are too busy making our own brand ! You may see our brand stocked by some quality dog trainers/behaviourists/rescues as we supply them with our brand as their preferred brand eDog. Not all quality dog harnesses will give comfort and good fit. 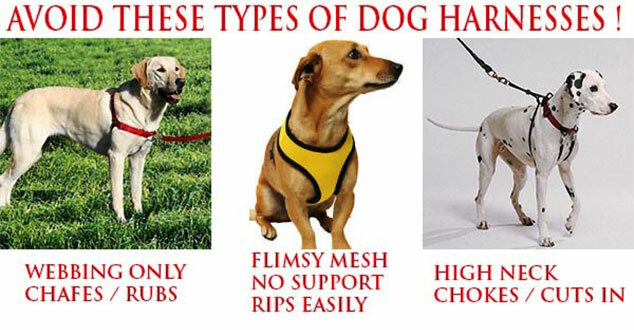 In many cases a good fit can only be achieved with a custom size dog harness- if your breed is deep-chested to any extent like a Greyhound (unless a large male fitting into our standard size DM)/Staffy/Whippet/Bull Dog/Boxer/Dalmation/Pug/Cockapoo/Standard poodle/Dachsy/Poodle etc., your dog will need a custom size for a good fit, otherwise the girth strap of the harness will sit too close to the back of the front leg – another common thread complaint from dog owners having bought harnesses that rub/chafe . We make any size therefore – we are the only UK dog harness manufacturer that can make any size to fit well for any breed. All we need is for you to call us armed with a soft tape measure and your dog in tow and with 3 or 4 simple measurements – which we talk you through – within 10 mins we’ll know the size to make to give your dog a perfect fit. We offer 12 standard sizes and any custom size. That’s how our harnesses have become known as the best dog harnesses in the UK and the word has gradually spread to Europe, USA and Australia to name but a few countries we have sent to. We manufacture comfy, well-fitting eDog (excellent dog products for every dog) brand fleece harnesses and our Splashy Dog harnesses for dogs who like to get wet. Custom sizes in plain fleece range from £27.99 for a tiny toy breed – £55.00 for a very large dog. We also manufacture dog coats, dog collars, dog leads too. Cost – you can pay big money for certain branded, mass produced harnesses made by Ruffwear and Hurtta for example, but these will be in standard sizes only and certainly will not deliver on comfort in any size – both brands are made in China. So don’t think purely because you are paying £60+ for a well-known brand that it will be the quality or provide the comfort you expect from the description. These harnesses are the biggest money-spinning rip-offs as they cost the brand owner only a few dollars to manufacture in China and turn dollars into 600% profit at the dog owners great expense and extreme disappointment. So avoid any walking harnesses made in China if you want comfort and quality. We received Kip’s custom made harness today and it fits like a dream already…..at it’s smallest as he is only 5 months…there is plenty of growing room too. You may be able to see from the pics that his poor little chest has been rubbed by previous harnesses ( all of which seemed soft enough and also to fit…how wrong can you be!). Your harness completely avoids this tender area and, hopefully, will allow his coat to recover. He is such a happy little chap and deserves the best! I hope to be able to email you an “after” photo in a few months and show you him restored to his former glory! Thank you so much for your help, friendly, sensible advice and efficient service….I am SO glad I found your website and only wish I’d discovered it sooner…..I’m sure Kip would agree! Wendy called us days after receiving Kip’s harness and ordered another one of our fleece harnesses for her other fully grown tiny toy dog. What we do for pups – to get time from the harness and therefore value for money, we make the neck opening slightly too big and make so your pup is at the beginning of the girth span, so there’s plenty of room for growth – this prevents you having to buy a standard size whereby your dog may already be half-way into the girth span -Oscar below – is a puppy 11 weeks old so we made it so it will last 2-3 months. We also give a Pup discount code for 5% off to make buying your next harness size a bit easier on the pocket. You will get the best puppy harness from us. Hi Joanne , just received the lead today to match the harness and will try to take a photo of Oscar wearing it (at the moment he tries to chew it!). Find attached a photo of Oscar wearing his harness on his first ever walk in the country which was last Saturday. He was eleven weeks old at the time and the harness is a great fit. Quickest and easiest way to get correct size dog harness for your dog/puppy and therefore a comfortable, well-fitting harness, is to call us with your dog in tow and a soft tape measure – takes 10 mins. Check out our special offer of half-price fleece lead with any fleece harness, standard or custom size.